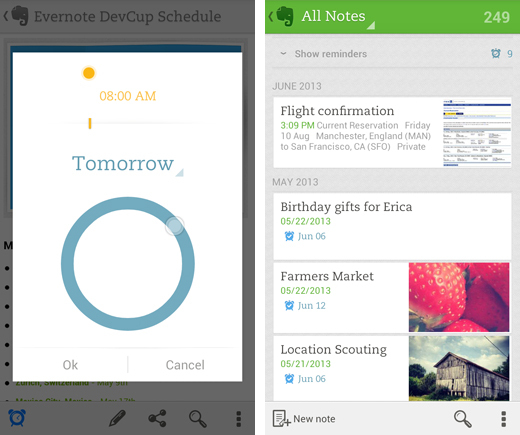 Exactly two weeks after launching customizable reminders on iOS, Mac and the Web, popular note-taking service Evernote is bringing its latest feature to Android. The new tool gives users the opportunity to add specific deadlines to any of their notes, removing the need for a dedicated calendar, to-do list or alternative productivity app. The Android app now includes a small alarm icon just above each note, which users can tap at any time to add a reminder. There’s also a neat pop-up screen for choosing a specific date and time, as well as the option to receive a notification – either through Android or as a standard email – when the deadline approaches. 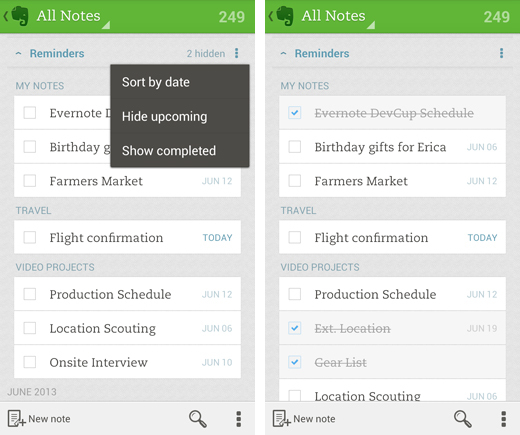 Notes with reminders are then pinned to the top of the user’s note list, as well as any tag lists and search results. These reminders also sync across nearly every version of Evernote, including Mac, iPhone, iPad and the Web, ensuring that the user is always aware of upcoming deadlines, regardless of which device they’re accessing the service from. Evernote is also pitching its new reminders feature at businesses and those who use the note-taking service within small groups. Users can choose to subscribe to the reminders attached to any shared or business notebook, subsequently receiving notifications as they would with their own notes. When a reminder is completed, it’s also possible to dismiss it early using the app’s check box system. Evernote says that reminders have been one of the most highly requested features from it’s userbase, so it’s reassuring to see the Android app updated such a short time after its iOS, Mac and Windows Phone counterparts. The company has also used today’s update to roll out a few other improvements in the Android app, including a simpler process for copying and pasting text in note view, as well a corrected order for images captured with the multi-shot camera functionality. Shortcuts have also been revamped this time around, in addition to improved Japanese language support. Evernote continues to evolve its note-taking service with new functionality that easily outstrips its closest competitors, such as Google Keep. The cross-platform roll-out for reminders should keep its users engaged with the platform and away from other productivity apps such as Clear and Wunderlist, which opt for an arguably simpler UI and smaller feature set. The updated Android app is available in the Google Play store right now.